Great Gift for yourself or the lucky iPhone X owner in your life! 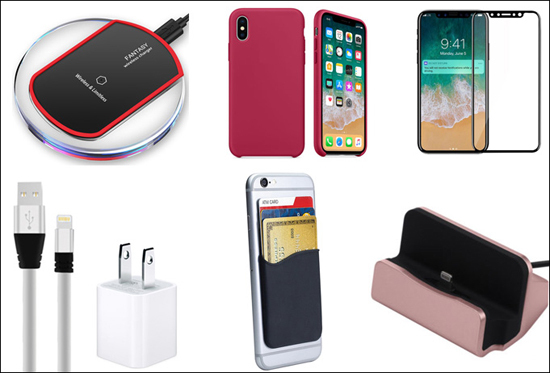 Experience a new and effortless way to charge your iPhone X - wirelessly (also works with iPhone 8). Simply set your iPhone down on the Wireless Charging Pad and get fast wireless charging performance. Slip happens! So protect your new iPhone X. 3D curved 9H, 0.33mm full cover tempered glass for iPhone X. Edge to Edge covered --- perfect fit for your beautiful iPhone X. We all have that spot where we drop our stuff the moment we step into our home or office. To help you make that go-to spot less cluttered, we created Charge & Sync Dock, the ultimate home for all your Lightning powered devices. This stand is small, light and portable and it's curves inspired by the newest iPhone design. 6 foot tangle-free lightning cable is a great size for using and charging your iPhone or iPad. Choose your color! Leave your wallet or purse at home! Put your essentials in the Cell Phone Card Wallet and you are all set! The Cell Phone Card Wallet attaches (via high quality adhesive) to the back of your cell smartphone case. Then simply add your credit card, ID and whatever else you need. Bam! You are good to go. Choose from several colors. Offers a stylish new approach to powering your smartphone while on the go. Use your smartphone as a 3D VR display. The perfect everyday accessory to be mixed & matched with your outfit of the day. Keep your phone in one simple, easy to reach place while you drive. The sleek cradle-free design works perfectly with larger devices.